In my past posts you would have read about Gio and Francesco from Green Italy Tours who very happily showed me around Puglia. One of the places I visited with them was the adorable little town of Alberobello. A UNESCO World Heritage Site since the year 1996, Alberobello is in the Itria Valley of Puglia. The entire town is dotted with little cone shaped homes called “Trullo” (plural: Trulli) which makes it a popular tourist destination. Imagine thousands of trulli together! You might ask, but what is there to do in Alberobello?? Well nothing really and everything at the same time. The town itself is so unique that taking a walk is what I would suggest. The locals are warm and welcoming to help you for any query! See the Hobbit type homes and the many shops around. 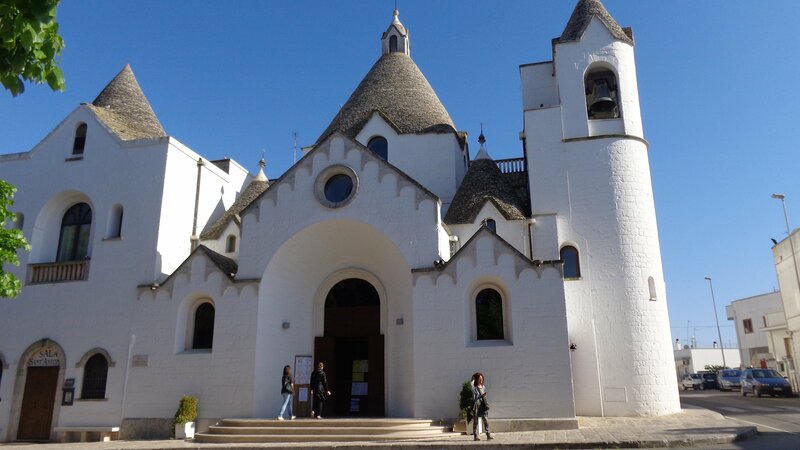 Visit the Museo del Territorio to know about 16th century Alberobello. See the Church of Sant Antonio. Stop for a lunch at Ristorante La Cantina and enjoy the Pugliese spread of burrata and fresh olives! Book in advance. Buy yourself a postcard of i trulli. Alberobello is an enchanting town. Imagine this is where people live and go about their normal life! I heard a couple fighting about the way lunch was made from inside a trullo. It wasn’t pleasant to the ears!! 😉 Have you been to Alberobello?? Are you subscribed to my Newsletter yet?? Looks like a unique and beautiful town, hope to go there one day. Thanks for sharing! Thanks for following along, Nikirath 🙂 It is. Any plans of Italy in the future? Beautiful, I think I remember reading something on your blog about it 🙂 Happy travels. I can’t get enough of the photos of this darling town, which I’ve yet to visit. I, too, would like to spend a night in a trullo! What is secret behind white colour on all house. What a charming place!! I can see why you loved it! Thanks Darlene .. Indeed. You are so near 😉 must visit, eh? Very nice photos! Puglia has been on my bucket list for a while now and Alberobello will definitely make it onto the itinerary. Thank you 🙂 I hope you can! It trulli is a magical place. The sky is always so vibrant blue. I’ve never seen roofs that look like that! That looks like a really magical place. If I get the chance to go to Italy next summer during my Europe trip I’ll definitely try to go there! Thank you Anubha 🙂 So nice to see you here. Keep coming! I missed replying here somehow Karmughil. Thank you so much! Thouse houses are just picture perfect – just so charming! absolutely are 🙂 thank you! We have a long Italy wishlist don’t we 😉 you’ll go there soon I know! Yes we do. You’ll notice I updated the layout of your piece on my blog. I hope u don’t mind that I share your pieces. I think we are going to have to plan a trip to Italy at the same time. It would make for a great story! I didn’t notice actually till you mentioned. Why don’t I get a reblog notification then? Is it because you changed it? Wonderful post! I’m saving it for my trip to Puglia which I hope will be next year. Beautiful Ishita…you took some great photos of Alberobello. It all makes me want to go back and spend more time. What fun you had! Thank you Susan 🙂 Its such a pretty place, hard not to take a nice picture. Ishita, I also took a look at Green Italy Tours. They look like a fabulous company. Could u say a little more about them? They are. The owner is very flexible, he will ask you your preferences and where you want to go and turn the day into so much fun! How beautiful! The houses are striking especially with their unique roofs! Thank you Indah 🙂 So nice to see you here, I love this part of Italy. Thank you Tanja. Indeed very intriguing. I missed replying here 🙂 keep coming back!